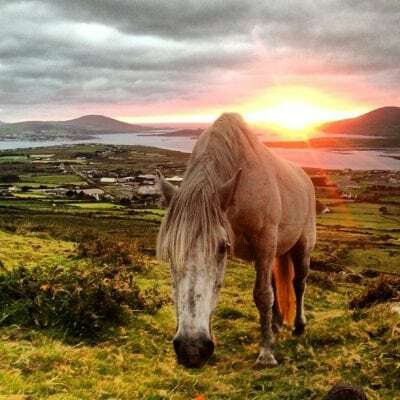 The Skellig Ring Scenic Drive is without doubt the best section of the world famous Ring of Kerry Scenic Drive and Wild Atlantic Way along the Skellig Coast in the south west of Ireland. The ‘unmissable’ Skellig Ring scenic drive starts in either Cahersiveen or Waterville depending on where you are on the Ring of Kerry and takes in awe inspiring views of the Skellig Islands at every turn, the wonderful Valentia Island accessed by ferry and bridge, the picturesque fishing village of Portmagee, Ballinskelligs with its great Blue Flag beach, the famous seaside Waterville village and all things these places offer. Take the Skellig Ring scenic driving route with you on our free App for iPhone and Android and share your photos on the ActiveMe facebook page. 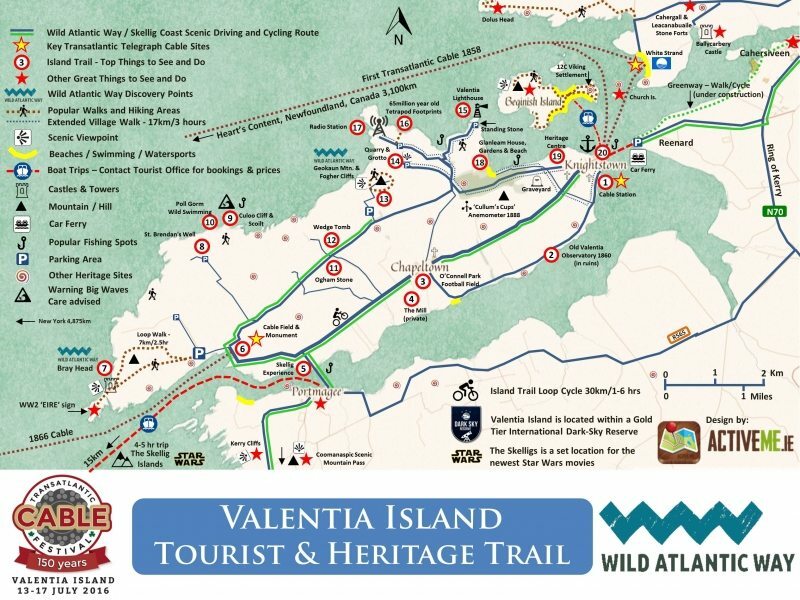 The unique Valentia Island is a holiday in itself with numerous things to see and do, so don’t miss it. 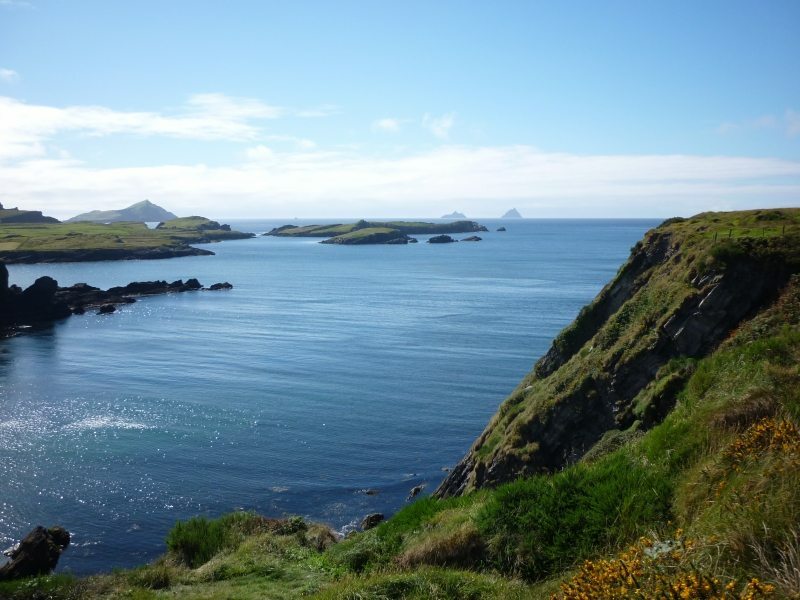 This Skellig Ring scenic tourist drive is a ‘must do’ and is recommended to be in everyone's Ireland holiday itinerary or their vacation 'bucket list'. In fact, Kerry's Skellig Ring was named in the Top 10 Best Places to Visit in the World by Lonely Planet's top 10 global destinations for 2017 which picks out the most unique, remote and inspiring destinations in the world. 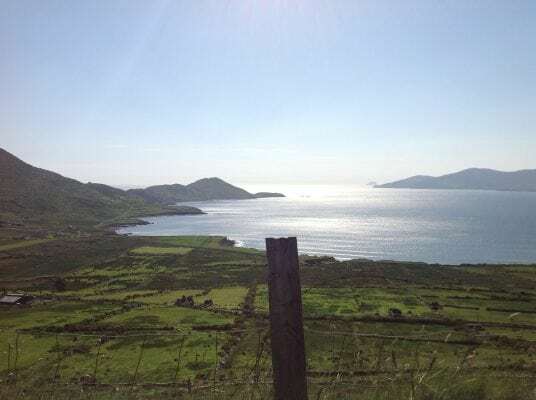 The famous Ring of Kerry drive is a 200km loop road trip starting from Killarney, heading clockwise around the Iveragh Peninsula to avoid any delays from Tour Buses which MUST travel anti-clockwise around the Ring of Kerry due to the narrow roads. From Killarney, The Ring of Kerry passes through Kenmare, Sneem and Caherdaniel before you arrived at Waterville and the start of the Skellig Ring where you then visit Ballinskelligs, Portmagee, Valentia Island and Cahersiveen before finishing the Ring of Kerry through Glenbeigh, Killorglin and finally returning back to Killarney. In clockwise order around the Skellig Ring and starting near Waterville, some popular attractions and points of interest include the ancient Loher Stone fort and Derrynane House home of Daniel O'Connell and the Derrynane Blue Flag beach (near Caherdaniel) one of Irelands best beaches, Bolus Head near Ballinskelligs which also has a Blue Flag Beach and Castle, Skelligs Chocolate factory, Coomanaspig Mountain scenic viewing spot (near Portmagee), on Valentia Island you have trips to the Skellig Island World Heritage Site, the Skellig Experience Heritage Centre, Bray Head loop walk and views to the Skelligs, Culoo Cliffs, Geokaun Mountain viewing spot, the world famous Valentia Slate Quarry, the 350 million year old Tetrapod trackway fossil and Knightstown village and Heritage Centre, Cahersiveen Heritage Centre, Ballycarbery Castle, Cahergal and Leacanabuaile Stone forts and Rossbeigh Beach. 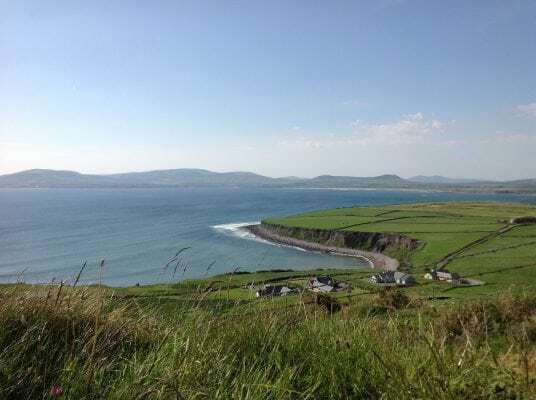 There is also an established long distance walking route called The Kerry Way, which takes its own route through this wild part of Ireland, and a signposted Ring of Kerry cycling path which uses older quieter roads where possible. In short, the Skellig Ring scenic drive on the Iveragh Peninsula has everything. From the mountains to the shoreline, the walks to water sports, the eating, drinking and other entertainment you can’t go wrong. Stop off and stay in any of the towns and villages along the way and you’ll be in heaven. 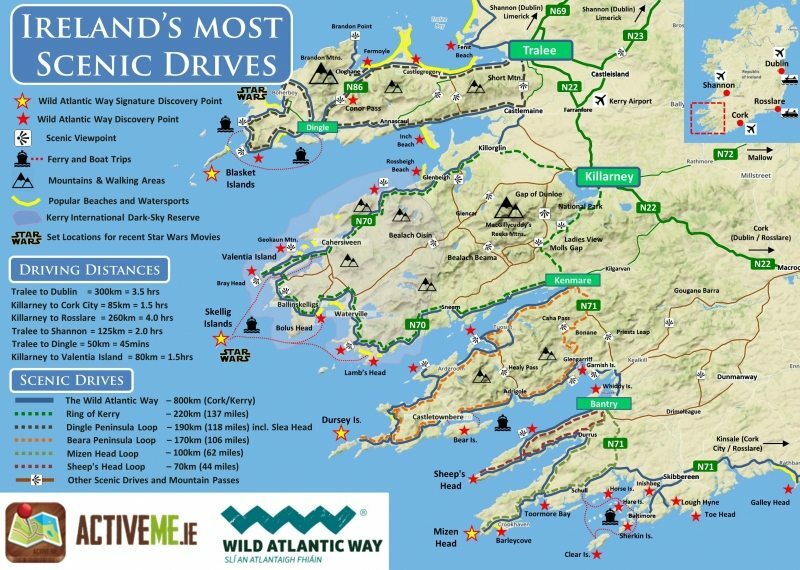 Take the Skellig Ring scenic driving route with you on our free App for iPhone and Android and share your photos on the ActiveMe facebook page.